← Special Offer for Loyalty Members! You expect Columbia’s Best Quality at Lowest Prices, but did you know that we repair too? Satterfield’s Jewelry Warehouse has full service on site jewelry repair at each of our 3 locations. 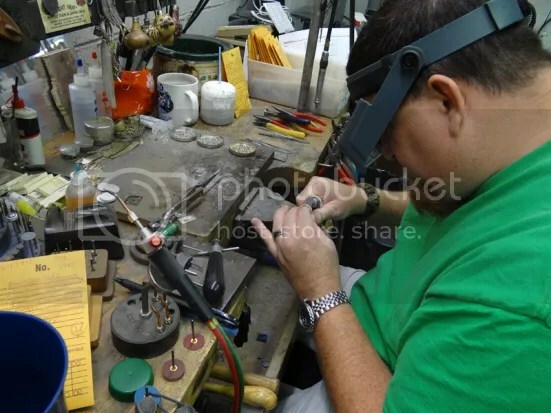 Satterfield’s Jewelry Warehouse offers a complete range of jewelry repair, alteration, and remount services including Gold, Platinum and Silver Jewelry Repair, Laser Welding, Solders, Ring sizing, Stone setting, Engraving, Watch batteries, Remounting, and Pearl Restringing. Whether your piece is worn, damaged, or simply out of style, our attentive staff and experience jewelers are dedicated to extending the life of your jewelry. Satterfield’s Jewelry Warehouse can offer you full size, on-premise repair and manufacturing facilities to service all your jewelry needs. We work on gold, platinum, and silver jewelry. You will have the security and peace of mind knowing full-time jewelers will work on your jewelry and it will not leave our premises. Can you repair or fix any type of jewelry? We can fix most jewelry that is brought in the store, however we can’t work on stainless steel or titanium. We cannot resize these metals. What limitations do you have, when up-sizing or downsizing rings? Most rings are only made to be sized about 3 sizes up or down, but over the years we have learned a few tricks to get them a little more. We stand behind our craftsmanship and in the event a repaired item has further issues, we will take all steps to satisfy our customers. Can you replace a battery on any type of watch, or just the brands that are sold at Satterfield’s Jewelry Warehouse? We can replace batteries on most watches except Eco-Drive Watches. Is there any type of repair that we can do, that other jewelry stores cannot? Most jewelry stores dove tail their ring sizes. We weld this way and it leaves no solder seems. When you polish the ring, the weld will be much stronger and last longer. Can you create custom jewelry designs? We have a CAD system that we can make custom jewelry like pendants and logos, but it doesn’t make 3D rings. We can create some custom jewelry, but our work load does not always allow us much time for it. Other information to let you know what we can do. We work on all types of jewelry, costume included. Stop by and see what we can fix for you. This entry was posted in Jewelry, Jewelry Guides, Jewelry News and tagged Jewelry, jewelry repair, jewelry warehouse. Bookmark the permalink.